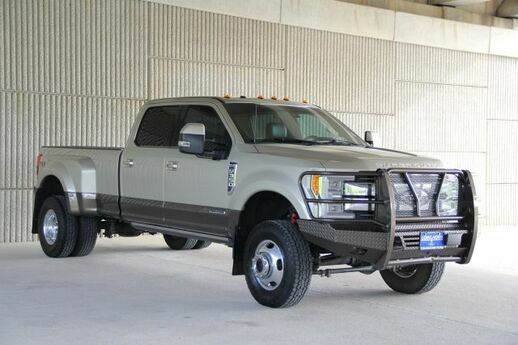 **NAVIGATION**, **MOONROOF**, **BLUETOOTH HANDS FREE CALLING**, **HEATED/COOLED SEATS**, HEATED REAR SEATS, F-350 SuperDuty King Ranch DRW, Power Stroke 6.7L V8 DI 32V OHV Turbodiesel, 4WD, Adaptive Cruise Control & Collision Warning, Adaptive Steering, Automatic High Beam, BLIS Blind Spot Information System, Colored Front & Rear Rancho Branded Shocks, Front Splash Guards/Mud Flaps (Pre-Installed), FX4 Off-Road Package, Hill Descent Control, King Ranch Ultimate Package, Lane-Keeping Alert, Multi-Contour Seats, Power-Deployable Running Boards, Quad Beam LED Headlamps & LED Taillamps, Rear CHMSL Camera, Rear Inflatable Seat Belts, Tailgate Step & Handle, Tow Technology Bundle, Twin Panel Power Moonroof, Ultimate Trailer Tow Camera System, Unique FX4 Off-Road Box Decal. Odometer is 11071 miles below market average! I would like to Check the Availability for this 2017 Ford Super Duty F-350 DRW King Ranch 4X4.